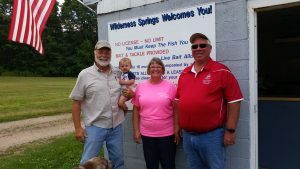 Wilderness Springs Inc., The Trout Farm, LLC was started back in the 1960’s. My wife and I purchased it from her parents in 1974 and it continues to be a family run business. The Trout Farm encompasses about 10 acres and consists of approximately 30 ponds and 12 concrete raceways with 8 (eight) artesian water wells. We purchase between 30,000 and 50,000 Rainbow Trout eggs each year, that we hatch and raise for live delivery of stocking ponds and our on-site fee fishing operation. The eggs we hatch will be large enough to stock into ponds within a year, depending on the size, and the fish that are sold for fee fishing are 2-3 years old. These trout are sorted in raceways and ponds by size and the amount of trout that the raceway or pond is able to sustain. Over the years we increased our trout production by installing high-capacity well pumps growing our water usage to 400 GPM. Several factors, including the high cost of energy and operating expense, along with a variable demand for trout, have caused us to adjust our production and our water usage to approximately 200 GPM. Reducing our water usage causes us to rely only on the free flows of the artesian wells in the the flow-through production of our trout ponds. I have been at the pulse of the daily events of the trout farm for the last approximately 40 years. Through seminars, Extension agents, business dealings with other fish farmers, and trial and error on our own farm, I am able to constantly learn more of changing technology and what has been done by other aquaculture farms to see what works or doesn’t work for various applications. Bill West runs Blue Iris Fish Farm, a 40 acre facility containing nine culture ponds and 12 culture pond-side tanks. Blue Iris is located approximately 12 miles north of Appleton, WI. Blue Iris specializes in the culture of perch and bluegill mostly for the fish food market. Blue Iris conducts research to enhance culture production and grow-out. A SARE grant (FNC08-731) and Wisconsin ADD grants 21014 and 24023 completed work on elimination of digenetic trematode infestations of perch and bluegill and completed an in-depth assessment of creating a fish cooperative. Blue Iris participated in a federal feed study (least cost diet studies conducted by North Central Regional Aquaculture Center (NCRAC) in 2012). Blue Iris also participated in a study with Milwaukee School of Freshwater Sciences in comparing grow-out of perch using a fish vs non-fish meal diet. Blue Iris currently works with local high schools in providing fish, feeds, and research ideas for local agriculture programs. 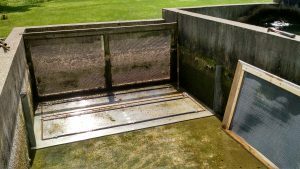 Build an RAS type bio-filter into existing/operating trout rearing tank. The objective is to filter out ammonia nitrogen and increase production density (fish production) of downstream tanks. Suspended solids by-pass plastic media bed is now constructed and bacteria beds are established. Reconfigure cold water ponds (reduce size) to make more productive. Reshape to reduce dead spots or deeper as required. Additional spillway constructed and installed here. Dig large pond and enlarge existing smaller trout ponds to become large area lagoons to grow perch. Fabricate new flow control spillways for additional ponds created. Another new spillway was installed August 2016. The bio-filter is installed. Needs a few more months for bacteria to grow and activate the filter function. Started pond renovations required. Installed new water spillway. Now weather permitting, will do digging required to enlarge ponds for perch raising. Purchased some perch brood fish to obtain eggs to hatch and grow for this project. Perform cold water, water quality analysis to measure how efficient a flow-through, RAS bio-filter can be in cold water application. Measure and record results. Was Ammonia Nitrogen reduction realized? Did this process/install cause stress to fish raised downstream of bio-filter? The large pond drain structures are installed. Next is to excavate the cool water ponds as planned. 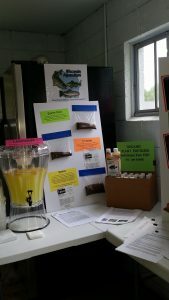 July 2016 we hosted Wisconsin Aquaculture Day (3rd Sat in July) at our Trout Farm. We had 40-45 people attend. Throughout the day we explained what we are doing with our project and what we’re hoping our results will be. Many did not have any idea of what the bio-filter would do so we explained that. Does it digest organic waste? Does it remove Ammonia Nitrogen gas? If so, how much? Observations were that bug larva in & around the bio-filter is creating some natural feed for downstream tanks. We are preparing presentations for Ag classes at 3 different High Schools. Once we have more data we will write articles for the Wisconsin Aquaculture Association (WAA) newsletter, The Creel. We also plan to give a presentation at the WAA conference and future annual Aquaculture Day events. Water tests were conducted with air injection aeration both with air on and air off the bio-filter. AIR OFF: Values for dissolved oxygen were infeed 6.6 mg/l to outfeed 7.0 mg/l. The carbon dioxide levels were infeed 70 ppm to outfeed of 80 ppm. The data suggests the aeration produced the most noticeable change. The dissolved oxygen net increase was more than 3 fold. The carbon dioxide retracted 35 ppm from what was an increasing 10 ppm average. The aeration component of this model improved the dissolved oxygen level and reduced the carbon dioxide level. The target of this bio-filter was to measure any drop in the ammonia nitrogen level; however, no significant drop was measured from inlet to outlet points. The temperature at 56°F, appears to have slowed the bacterial action of the bio-filter. This process improved the water quality to the fish downstream due to the increase of dissolved oxygen level with the aeration on. In addition the installation of variable pond water structures allowed for increased gravity aeration in cold water remodel of existing ponds. Excavated additional large cool water pond with its new water control structure. 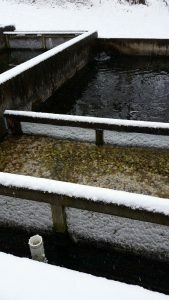 This is located below existing cold water pond which is to be used for perch production. Perch were stocked in cool water pond. We observed some spawning activity, however, the perch ribbons failed to hatch. We plan to continue future attempts to successfully spawn perch in this pond. 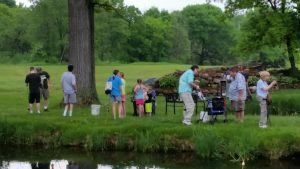 July 2017 we again hosted Wisconsin Aquaculture Day (3rd Sat in July) at our Trout Farm. The attendance was down considerably from the previous year, we assume due to the weather that day. Those that attended were interested to hear about our research project: What our results have proven thus far concerning digestion of organic waste, the ammonia nitrogen levels and the increase in bug larva. We gave a short summary presentation at the 2017 Wisconsin Aquaculture Assoc. Conference. We have prepared a short article for an upcoming Creel (WAA Newsletter). Remodel operating cold water trout farm into combination cold water/cool water fish farm. Improve and maintain and system with good water quality, positively impacting the environment. Create a system that will maximize profits by reducing water usage lowering energy costs. Provide high quality, healthy, uncontaminated fish to local consumers. Phase 1: Remodel existing downstream cold water ponds to accommodate perch propagation. This had us reconfigure ponds by enlarging 3 and adding 2 new ponds. Following this, we stocked perch into the ponds for brood fish. The following spring ribbons of perch spawn were present in the ponds. In addition, we obtained additional ribbons of eggs and set them into a vertical flow barrel incubator. In both cases, the eggs began to fungus up. The eggs in the barrel incubator were unsuccessful in hatching as were the ribbons of eggs in the ponds. For our next attempt to hatch perch ribbons, we are creating some pond structures to enhance the spawning habitat. Phase 2: This involved some pond reconfiguration as well, but the bigger task was to design / install a Recirculating Aquaculture System (RAS) to improve the water quality of an existing group of 10 concrete tanks. All of these tanks are 20′ long x 7′ wide x 3′ deep. In each tank, the average water depth is 2′, with well water flow of 40 GPM (gallons per minute) and temperature at 56° F. An RAS type filter was installed into tank #8. The filter size was 20% of the volume of the rearing tank. This is a photo of the construction of the bio-filter. I made a base plate out of stainless steel, which was raised 3/8″ off the bottom of the tank. The purpose is to channel the solid waste under the filter media where the solids would still accumulate behind the end screen. I formed up 18′ of an air hose that would be connected to an air compressor. Once this was completed the screen was lowered into the channel in front of the filter. With the bio-filter set up, the space between the two screens was filled with Kaldness K3 Media and the tank was filled with water. The bio-filter and media have been in place for 10 months, during which time the plastic media bed has colored and filtration process (bacterial waste digestion) has been observed and documented. Water analyses were performed to measure the effect of the bio-filter. Water checks included: alkalinity, ammonia nitrogen, nitrate nitrogen, dissolved oxygen (DO), carbon dioxide (CO2), temperature and pH. Water tests were conducted with compressed air-injection aeration both ON and Off of the biofilter. Air OFF in-feed / out-feed values for DO = 6.6 / 7.0 mg/L CO2 = 70 ppm / 80 ppm . The data suggests that the aeration produced more noticeable change. The DO net increase was more than 3 fold, while the CO2 retracted 35 ppm from what was an increasing 10 ppm average. 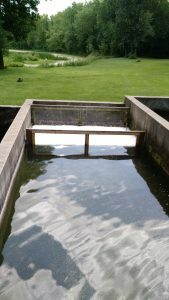 The aeration component of this model — improving the DO level and reducing the CO2 level — is a water quality improvement. The target of this bio-filter was to measure any drop in the ammonia nitrogen level. However, no significant drop was measured from inlet / outlet points. The temperature of 54° F appears to have slowed the bacterial action of the bio-filter. We presented our project at the WAA annual conference as a workshop type forum. We had 30+ people attend; some were farmers & others were educators. At the point that we gave the presentation, we were still in the beginning stages of our project. There was a lot of discussion & interest in the project. 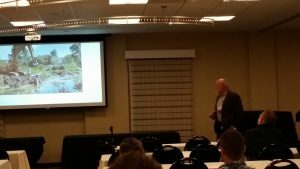 Mike gave an informational talk at the WAA Conference about our project. Another avenue of education was the annual WI Aquaculture Day that we hosted at our farm. This was open to the public & we had numerous lay people visit the farm who were interested but not actively involved in aquaculture production. A legislator & people from the media also attended. We shared our vision for how aquaculture needs to expand into the private sector more to be able to be a reliable & safe source for people to get food fish. The pond remodel portion of this project was successful in the fact that it provided more pond space/surface area for perch culture. Efforts to hatch & propagate perch are on-going. Our first attempts weren’t successful, but we’ve developed a new incubation system which we believe will be productive to a better outcome of perch. Advantages would be improved pond reconfiguration to have brood fish. Disadvantage is it was difficult to determine why the ribbons of perch eggs did not hatch. Was it lack of fertilization, water temperature or other cause? This is one of the issues we are attempting to solve for successful hatch in the future. The bio-filter project we proposed was to improve the net water quality of an existing flow-through cold water raceway system. This operating temperature is approximately 56° F , which is conducive for a bio-filter to function. The bio-filter project was sized to 20% of the tank capacity & average Rainbow trout density was maintained. After construction & operating for 12+ months, the results realized were insignificant; water test for alkalinity, ammonia nitrogen, nitrite nitrogen, temperature & pH all of which remained constant. With the filter running the dissolved oxygen increased by 18% & the carbon dioxide level decreased by 21%. At the beginning of this project we proposed to answer three questions with respect to the RAS bio-filter application. 1. Does this RAS bio-filter digest organic waste? Organic waste in this trout rearing facility becomes an accumulation of solid waste settling on the tank bottom behind the tank end screen. With this project, I built the bio-filter on a base plate raised 3/8″ to channel the solid waste under the filter media when the solids would still accumulate behind the end screen. 2. Does this bio-filter remove ammonia nitrogen? If so how much? By design, the bio-filter will grow nitrifying bacteria which dissolves nitrogenous waste products caused by aquatic organisms. In the bio-filter naturally occurring bacteria oxidizes the ammonia and converts it to nitrite, which converts to nitrate. Nitrate is the end product which converts to ammonia. Water tests of our model showed values to be constant for: ammonia nitrogen 0.25, nitrate nitrogen 0.05, temperature 9.5° C, and PH 7.5. After 2 months of the filter completion, we turned on the air compressor which delivered air supply through the 18′ of diffused hose. After 10 months of operating, the dissolved oxygen level raised from 5.4 mg/L to 6.9 mg/L and the carbon dioxide level fell from 125 ppm to 90 ppm. With these results noted there was no noted improvement in the nitrogen. Observations about the increase of bug larvae. With the increased surface area of the bio-filter and the fact that this was an outside operating system; the organic activity increased notably. We observed an explosion of bug larva in the filter structure and behind the tank end screen. There was a constant presence of larva film on the water surface; which would drain down to the following tanks, which the trout below fed on. This continued even throughout the winter months. In summary the project proposed, I expected this RAS bio-filter to create an improvement in flow-through water quality. My pre-research supported the size and configuration for this application. Post project data shows little or no measureable water quality improvement for ammonia nitrogen correction. However, the aeration did improve the dissolved oxygen and reduced the carbon dioxide levels. No stories to report as we are still in the learning stage ourselves.